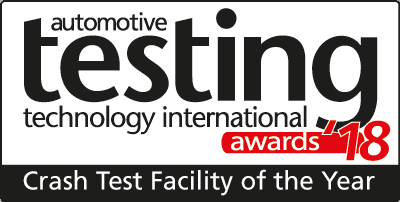 MESSRING once again presents itself as the world’s leading manufacturer of crash test systems and their components: According to the company, the Automotive Testing Technology International Magazine has just voted a MESSRING system “Crash Test Facility of the Year” for the seventh time in a row. For the year 2018, the new Calspan crash test facility in Buffalo, New York, was awarded the prize by the top-class international jury headed by the British specialist publisher UKi. Calspan, one of the leading American test and research companies in the transportation sector, maintains its own test laboratory with a large number of test facilities at the company’s headquarters in Buffalo, New York. In the previous year, the Mercedes-Benz Technology Centre for Vehicle Safety (TFS) in Sindelfingen, a facility designed by MESSRING, was again honoured as the world’s most important new development. Calspan opened a new crash test facility in Buffalo with a total area of 5,500 square meters, consisting of a state-of-the-art crash hall with two separate impact areas. Frontal and side impact tests can be performed here simultaneously and independently of each other. MESSRING was significantly involved in the planning and realization of the system. Both crash areas are also equipped with state-of-the-art MESSRING technology. These include the innovative MicroTrack rail system, the M=Wall force measuring wall and a generous car-to-car crash area. The system is designed for all current test configurations and is already equipped today for a large number of future test scenarios. In the current constellation, up to 500 test runs can be performed per year. In order to guarantee Calspan customers the greatest possible security and anonymity, for example for tests with prototypes, the entire test centre is subject to an identity card check and a 24/7 safety net. In this way, vehicles from different manufacturers can be tested at the same time while maintaining the strictest secrecy. In October 2017, MESSRING and Calspan entered into a strategic partnership. The cooperation includes the joint construction of new crash test facilities in the North American market as well as the upgrading of existing facilities and the development of new test equipment and services. “While I understand that MESSRING has been recognized with this award in the past, it is a very positive reflection of the sustained quality and success of the organization”, says Gregory Campbell, Vice President of Calspan Corporation: “We are grateful to have partnered with MESSRING and happy to share the success”. Dierk Arp, Managing Director of MESSRING, is equally positive about the future: “The award comes at exactly the right time for us because it shows what we can achieve together with our partner Calspan in North America”.